It’s 2018 and Facebook is still the best social media platform when it comes to connecting businesses with potential customers. This includes both business-to-consumer (B2C) and business-to-business (B2B). Even with the recent controversy over data privacy, Facebook remains and looks to still remain at the top. To us, it’s simple. Many businesses either are too hesitant to spend their marketing resources on Facebook or are poorly executing their marketing strategy by not understanding the Facebook platform and audience. This means there are a lot of opportunities to find a winning strategy. In this post, we’ll review everything you should know about using Facebook for Business. Future posts will cover some of the topics covered here in more detail, so be sure to check back often. We’ll also keep this post up to date with the latest info. Consumers spend a serious amount of time on social media, and reaching your audience where they spend the most of their time is important. This is why advertisers created TV and Radio commercials in the past. The difference, however, is it’s almost impossible to reach your audience on TV and Radio for free like you can on Facebook. I often find myself defending Facebook as a platform. People often say, “our audience is an older generation and not on Facebook” or “our topic isn’t relevant on social media”. That line of thinking is simply wrong. Facebook has over 80 million users aged 45 or older and with Facebook’s audience and ad targeting tools, you can make sure that your message is reaching the right audience. What makes Facebook, and Digital Marketing in general, a win for any business is the ability to test ideas, track advertising spend, and measure conversions. These techniques allow marketers to spend more wisely and keep their cost-per-acquisition lower than is possible with traditional advertising methods. With the right mindset, it’s easy to see how marketing your business on Facebook can help keep costs low and improve profits. 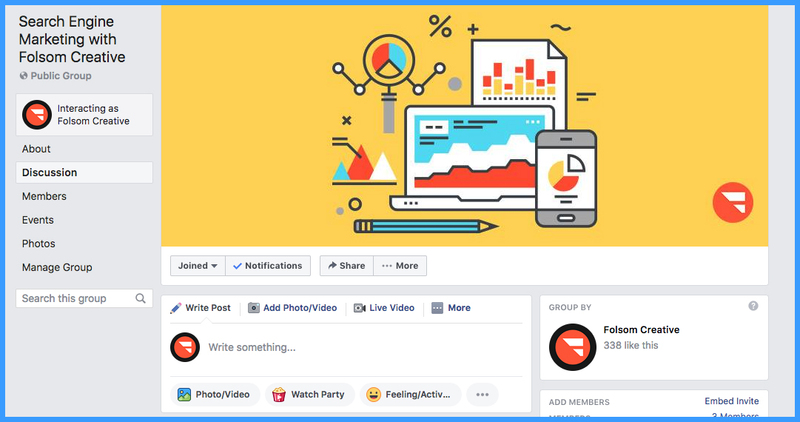 Setting up a Facebook Page is super simple, but the process has changed a bit since the early days of the platform and many businesses are still creating pages as individual users. 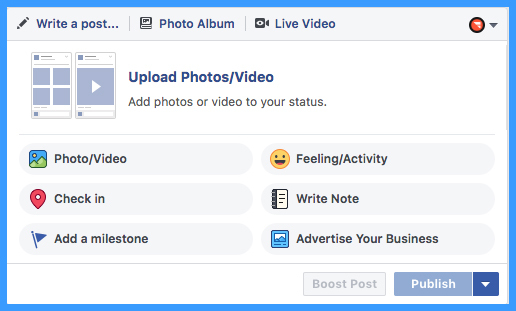 I’ve outlined the correct steps that businesses should use to create and manage their Facebook assets as a business. 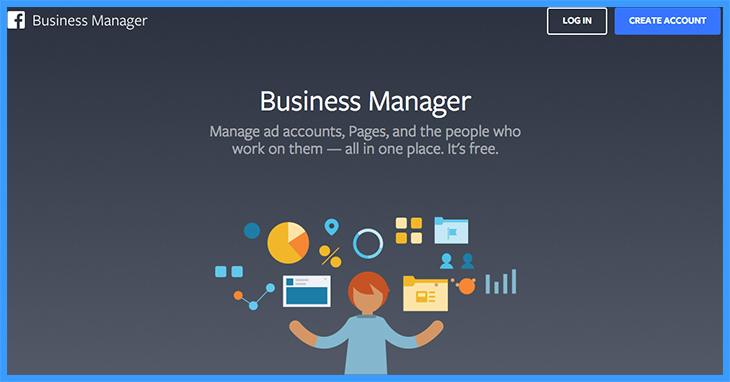 Your first step is to set up a Facebook Business Manager account. I suggest that a marketing or system’s admin be put in charge of creating the account. This person will be responsible for granting access to future page managers. During the signup process, Facebook will request that you log in with your personal account to authenticate; however, your Business Manager account can be associated with your business email during setup. Once your Business Manager is set up, it’s time to start adding assets to it. 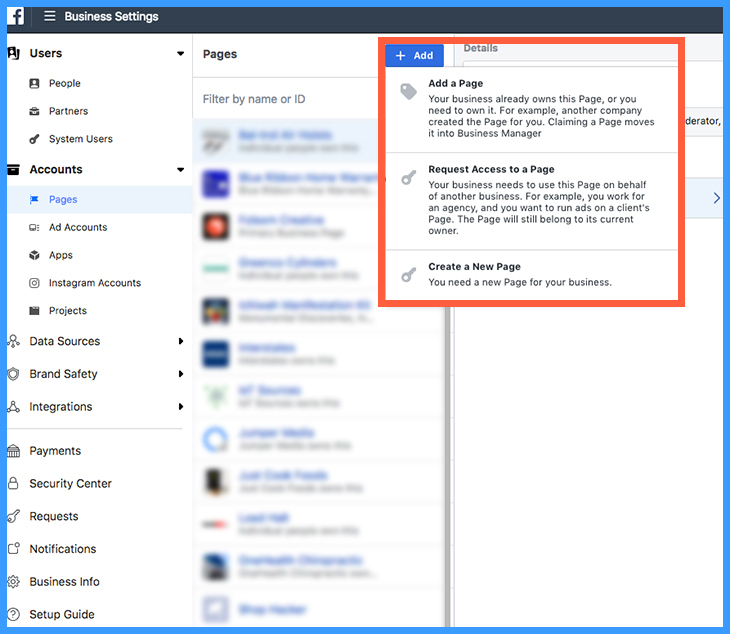 If you already have a business page created, you can claim your page from your business manager account. If you’re starting fresh, you can simply Create a New Page. Assign your page the business name that your customers are most familiar with. That may mean leaving off Inc. or LLC. Setting a profile photo, AKA page photo, helps users identify your page in a search, comments, and shares. Make sure this photo is your square logo or icon, is readable, and isn’t getting cropped off in the round versions that get generated for areas like comments and shares. This is the image that users will see first on Facebook, so make sure it is high quality and is the best representation of your brand. Pro Tip: Page Photos are 160px by 160px but uploading a 720px by 720px image can help you prevent the photo from being compressed. 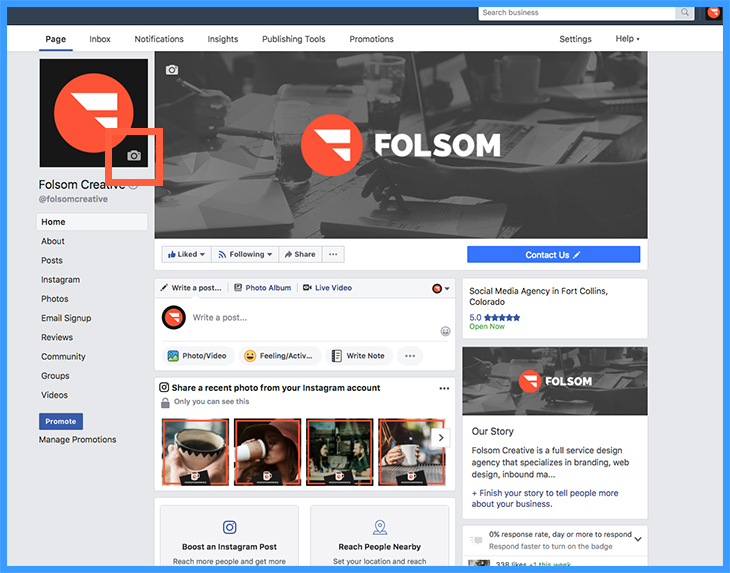 A cover photo is where you can give your page a bit of personality. Cover photos should capture your branding, culture, product, or service. Avoid putting too much text on your cover photo. Pro Tip: Cover photos should be 851px wide and 315px tall on desktop computers and 640px wide by 360px tall on mobile devices. 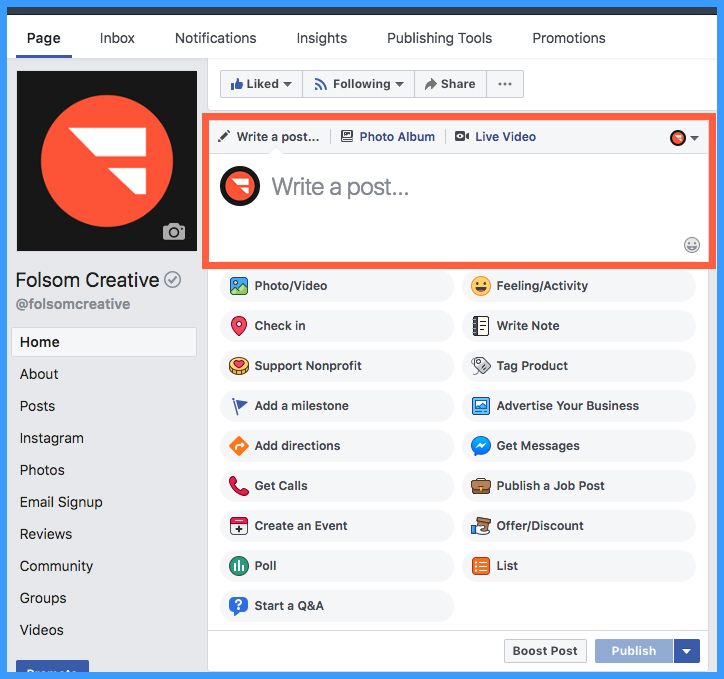 This is the most important step when creating a Facebook Page and many businesses fail to completely and accurately fill out the about section of their Page. Navigate to your page and select “About” from the left-hand column. Once on the about page, click “Edit Page Info”. This section will allow you to add your basic info like Contact, Location, and Hours. When adding your address, make sure it matches with other services you use, like Google My Business for example. This will ensure that your NAP (Name, Address, Phone) data remains consistent. Once you’ve added your basic information, be sure to add your business story, your mission statement. Completing the Additional Information section will ensure that your business page is easily searched for and that it does a good job of informing potential customers about your business. 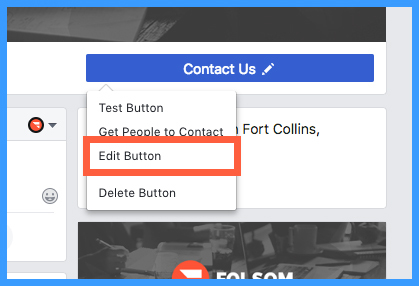 On your Facebook Page, right under the banner image is a call-to-action button that you can customize to match your business’s goal. If your business has an Instagram profile, as it should, you can link up your profile with your Facebook Page. Since this article is about Facebook specifically, we’ll look at linking your Instagram profile from Facebook. Click “Settings” at the top right of the page. Click Instagram from the left menu. Now your page is all set to manage your Instagram account from Facebook. You’ll now be able to update your Instagram account details, manage comments, and create Instagram Ads from Facebook. It should go without saying, you need to create a post on your page. Posts come in different types of formats to help your business best communicate with your audience. Since posting updates is the main way your business will be connecting with your audience, it’s important to share engaging content that’s designed to resonate with your audience. We’ll go more in-depth on this topic later on in the bonus section of this post. Now that your Facebook page is complete and you’ve added a post, it’s time to invite the friends and connections you’ve made on your personal profile. Be sure to only invite people who fit your target demographic and would likely engage with your content. While it may seem important to have a ton of page likes, it’s more important to have an engaged audience. A disengaged audience may actually lead to your content not being seen by many users at all. Once your page has 25 page likes, you’ll be able to set your custom page URL (if it’s available) by navigating to “About” and updating your username. This makes it easy for users to remember your Facebook page URL and ensures it’s on brand. If you added share buttons or links to your Facebook page to your website before you were eligible for a custom URL, be sure to go back and edit those links to point to your new custom URL. You’ll want to repeat this step any time you change your username. Facebook Pages have a few great features that are designed to help businesses engage with their audience more effectively. These features are often overlooked but can go a long way when working to increase engagement. 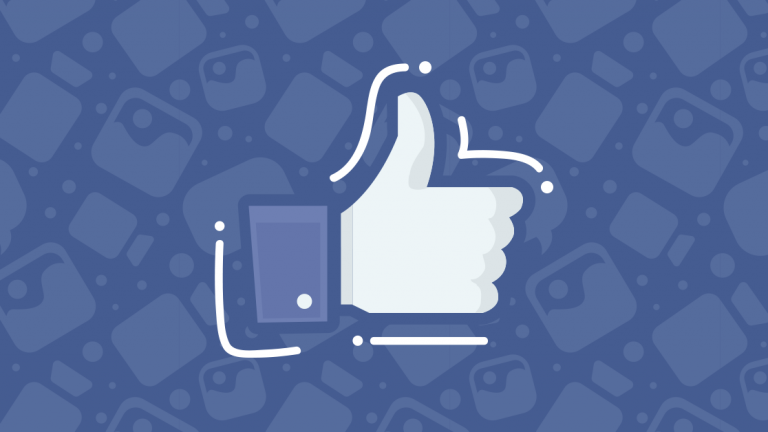 Let’s take a look at a few Facebook features to help your page improve engagement. 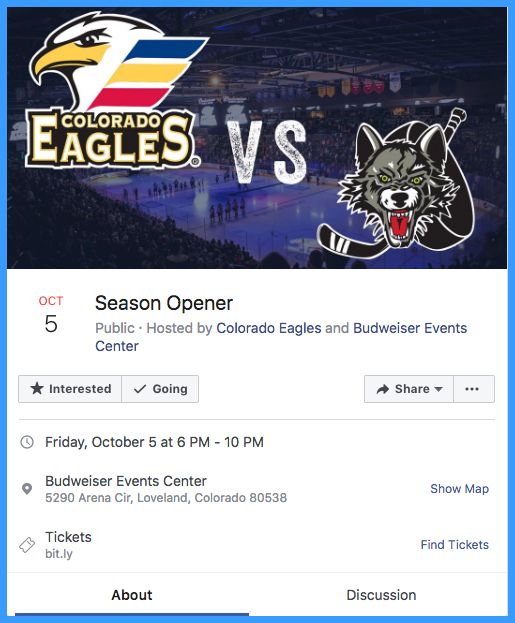 Facebook allows pages to create Events that users can RSVP to. Events can be held at a location, can be a webinar, or can even be a time that you’ll be answering questions on your page. 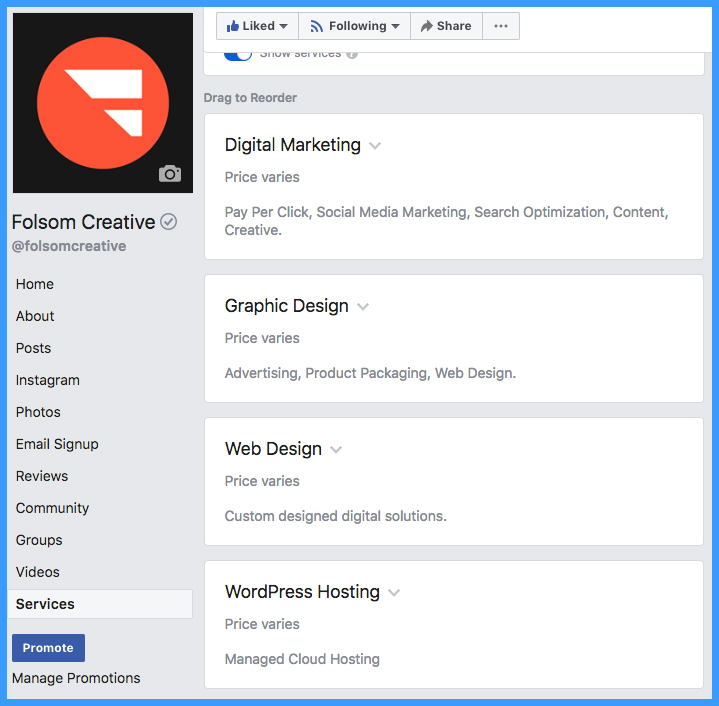 Adding a services tab is a great way to improve your search visibility on Facebook for users who might be in need of the services you offer but may not specifically know about your company. First, ensure you’ve added the services tab to your profile from the settings page. Once you have the tab enabled, navigate to the services page and click “Add a Service” and add each service you offer. If you have an offer or discount, a Facebook Offer will help you spread the word. Drive more sales on your eCommerce store or increase foot traffic to your local store with an exclusive discount. 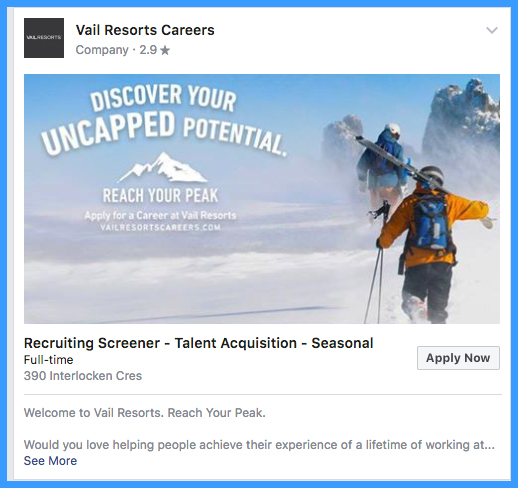 If you’re looking for new talent, create a Facebook Job Listing to increase your positions exposure. Users will often share job openings with relatives or friends and this is what really makes Facebook stand out as a job marketplace. Creating a Group from your Facebook Page is a great way to get the dialogue started with your audience. Groups can be public, private, or even hidden. Hidden and private groups allow you to create a sense of exclusivity and ensure you have full control over the quality of content being posted. We use several Facebook Groups to allow users to discuss different marketing and sales topics. This strategy ensures that each group has a focused and specific purpose. Try creating one or more groups for centered around your products or services. As an added benefit, users often find Groups to be less intimidating and more relevant than pages. This makes creating a Facebook Group a great way to capture the attention of a broader and more engaged audience. If you run a shop that sells products, setting up a Facebook Shop will help you easily promote, tag, and link to products. 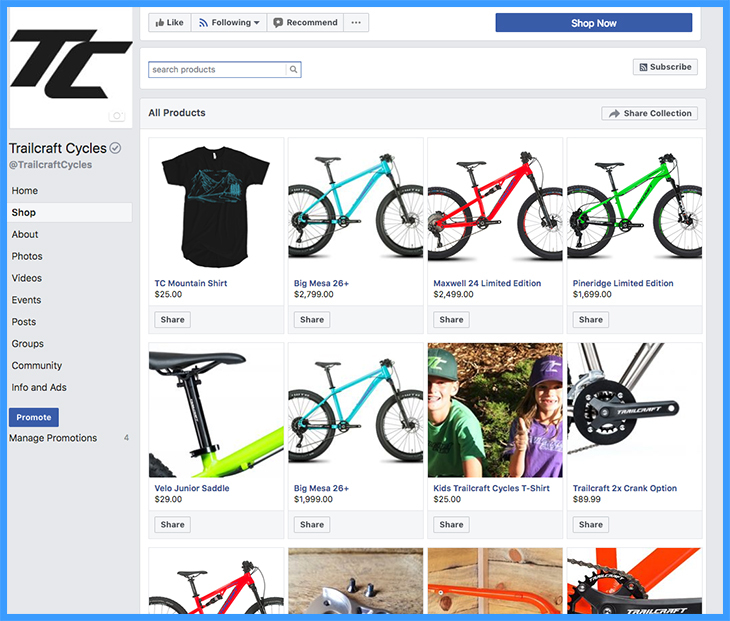 Facebook Shop also easily connects to popular eCommerce software like Shopify, BigCommerce, and WooCommerce making it easy to keep your catalog in sync. When your Instagram profile is linked, you can also tag products in Instagram posts. If you’re not posting videos on Facebook, you’re missing out on a huge segment of engaged users. Video gives users another way to interact with your page and the time spent engaging with videos can help improve how relevant your content appears to the Facebook Algorithm. Let’s take a look at how you can get started with Facebook Video. Every Facebook Page has the ability to post videos. It may be tempting to share a YouTube video on your feed but sharing content natively is always best. Head over to your Facebook Page and add a new video post. When prompted, upload your video file. Be sure to give your file a unique name and description. If you’re posting a series of videos, playlists can help keep things organized. Head over to the video tab and click “Create Playlist” to get started. Facebook Live is a great way to get in front of your audience without the production hassle of a typical video. Is your team having a competition, just finished a project, having a huge sale? Don’t be shy, just hop on Facebook Live to share the excitement. Looking for a bit of inspiration? 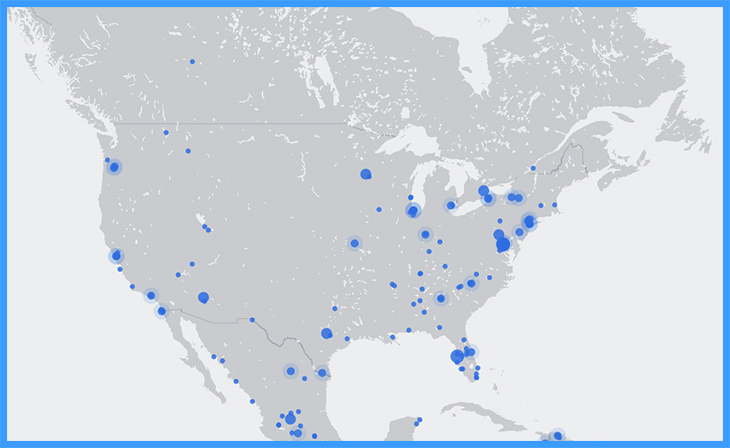 Check out the Facebook Live Map to discover others streaming near you. 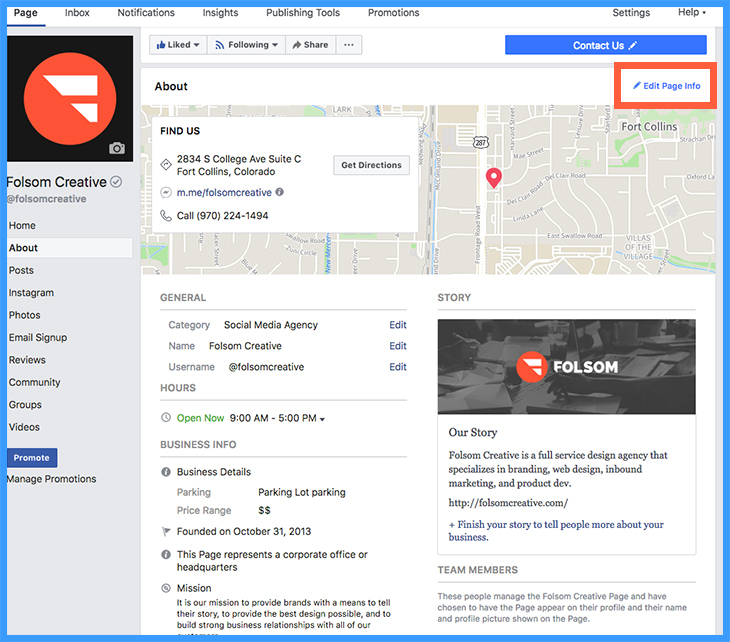 Facebook Show Pages is a new page feature that is being rolled out slowly to a select number of publishers. 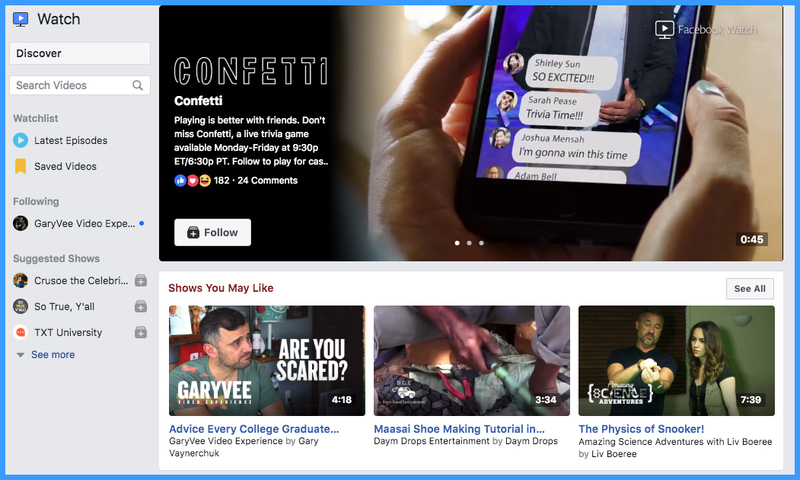 Similar to a YouTube Channel, Facebook Show Pages allows publishers to create a branded page centered around video content. If your page is large enough, you can apply to create a show page here. Let’s face it, reviews play a huge role in establishing trust. 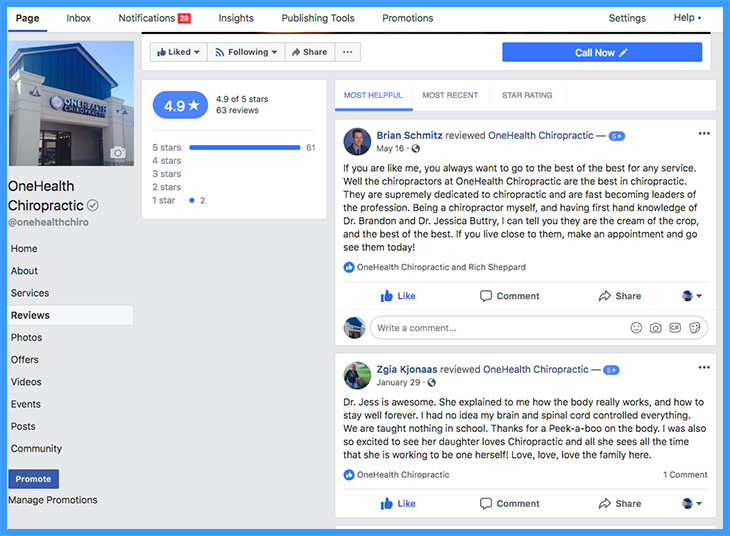 When a potential customer searches for reviews on a search engine like Google, you can have your Facebook profile show up as a result as long as you have one or more reviews. If your business recently had a positive client experience, ask them to share their experience on Facebook. Not only will the world get to see the glowing feedback, their connections will also see the review. This could lead to an increase in page likes and additional audience members. 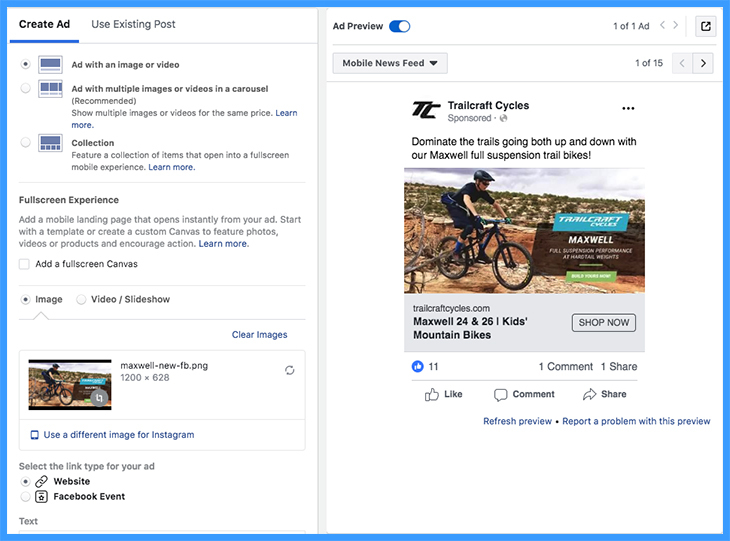 Facebook Ads is a low-cost advertising platform that helps businesses connect with potential customers. Facebook Ads utilizes the demographic data of its users to help advertisers better target and refine who is seeing ads and more importantly who isn’t. By being able to target with precision at a low cost, utilizing Facebook Ads should play a key role in how your business uses Facebook. This part of the guide isn’t meant to be an exhaustive Facebook Ads tutorial but rather a quick start guide to get you going. 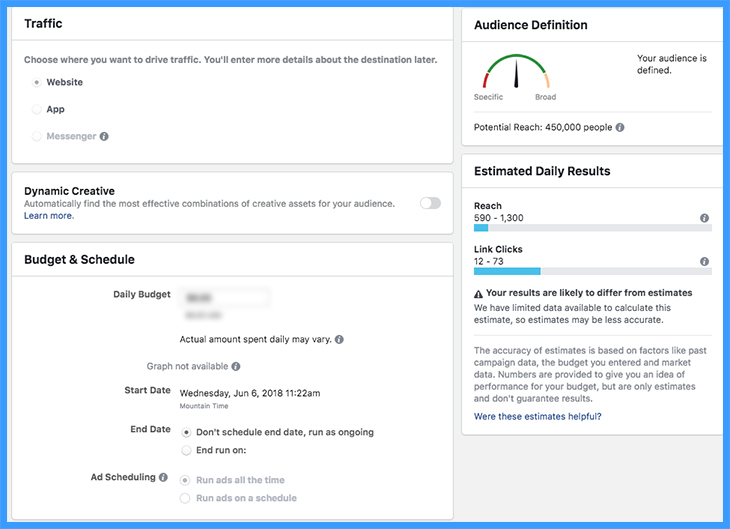 A more advanced Facebook Ads Guide will be published in the near future. The Facebook Pixel is often overlooked by businesses when setting up a Facebook Page. What many don’t realize is that the Facebook Pixel is what unlocks Facebook’s true power. Just like Google Analytics, the Facebook Pixel is a tracking script that is placed on your website. It has a lot of great features built in and with some modification can be used to track custom events as well. What makes the Pixel so powerful is its ability to connect your website users with their profiles on Facebook. While you can’t see specifically who is visiting your site, you can see the types of audiences that are viewing your website that is also on Facebook. Furthermore, you can group these audiences into categories based on behavior. We’ll learn a bit more about that in the next section. Audiences allow Facebook Advertisers to target different segments of users based on a few factors. As an example, you could create an audience of people who visited your site, interacted with your page, bought your product, or filled out a form. Each audience defines a group of people who engaged with your content at some level. The best starting place with audiences is to create an audience for each level of your lead funnel. For example, you might create an audience of website visitors, visitors who viewed a product, visitors who added a product to their cart, and visitors who checked out. For each level you’ll be able to create and target ads just to those users, allowing you to tailor your message specific to their interactions. What makes audiences even more powerful is Facebook Lookalike Audiences. With lookalike audiences, you can match profiles similar to an audience who never interacted with your content at all. Think about it. 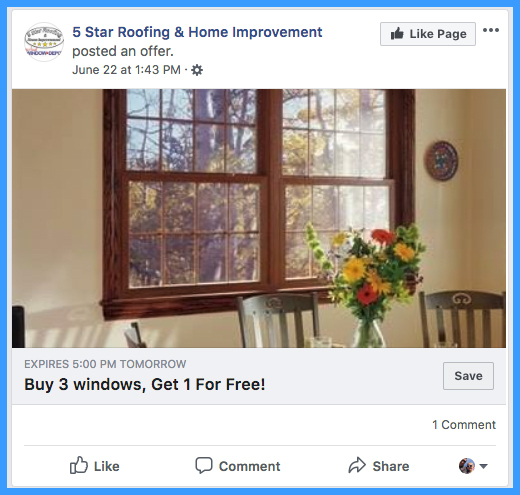 How powerful could it be to target ads to Facebook users who share similar attributes as your audience that has made a purchase or became a lead? This is what’s called “extending the funnel”. Now you’re reaching new users who are most likely to become your customer. The Ad Campaign is the container for any ad sets and ads that you create for your objective. Each campaign should have 1 primary objective and should be unique. A great way to think about an ad campaign is to think of a product or service type. You would first create a campaign to house all of your ads for those products or services. Be careful though. If you have vastly different products or services, make sure you’re creating campaigns for each type. An Ad Set is where you adjust your budget, targeting, schedule, bidding strategy, and placement. When using multiple ad sets you can test between targeting, bidding, and placements to better understand what ads perform best. An Ad is the actual graphics or video that you’re promoting to your audience. Just like ad sets, you can test multiple ads against each other to determine which ad collateral performs the best. In the past, analytics data was pretty limited. Facebook Pages only had Insights which basically showed low-level engagement stats. Now if Facebook Business Manager there is a new section called Measure & Report. This section gives businesses reporting on ad performance, analytics, and events. As an added bonus, you can even create tests to get a better understanding of how well your ads are performing based on rules you define. To guide all of your efforts, you should keep a close eye on Facebook Analytics. In Analytics, you can see how both your page and website perform. Be sure to check your analytics at least once per week to verify you’re seeing positive growth and engagement by new users. If you see a decline, dig into the data to see what changes you might make to improve your performance. To this point, we’ve mostly focused on sharing content natively on Facebook. But sharing a link on Facebook can be more complicated than just copying and pasting a URL. Let’s take a look at the best practices when sharing a blog post on Facebook. Open Graph allows web pages to share structured data with other websites. 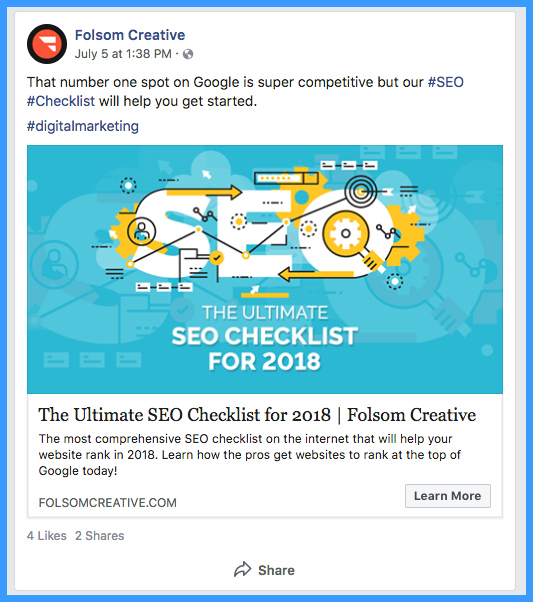 Similar to how the title tag or description of your page is used during the search, Open Graph data can tell sites like Facebook how to format your post. The most common Open Graph data a website will share is the title, description, and the featured image of your webpage. Each of these will be used to auto-populate the post on Facebook. Implementing Open Graph usually requires the assistance of a developer, however, most WordPress plugins and hosted platforms like Squarespace and Shopify also output Open Graph information automatically. Be sure to check with your developer or provider to see if Open Graph is a part of your website. We utilize Open Graph to set a custom image that gets used when we share our post on social media. This image includes the title of the post (something we don’t want to do for the featured image on the blog). It also allows us to make sure that our share image is the correct size and resolution. You took the time to create and upload a custom share image using Open Graph to find that Facebook is showing the wrong image. You’ve gone back and double checked everything but every time you paste in the URL to your page Facebook grabs the wrong image. This typically happens because Facebook saves these results whenever a URL is shared. If your share image has changed or the URL was entered before you have added your custom share image, you may need to tell Facebook to update the info it shared. Luckily Facebook has a Debugger for just this occasion. Simply enter your URL and Facebook will grab the updated information. This also works for all other Open Graph information as well. We got a bit technical there. Now let’s focus on the quality of your post. Don’t just share a link by itself, be sure to add a description and a hashtag or two. Before you hit publish, make sure every aspect of your post is correct. When you don’t spend much time on the content you publish it tends to show. Engagement is the key to winning the social media game, so take your time to make your post look perfect. Let’s face it, Facebook is a pay-to-play platform. If you want people to see your content, you need to be running ads and that’s okay. Advertisers don’t get free tv commercials either. The benefit is that getting your business noticed on Facebook is incredibly cheap and the ROI can be huge! 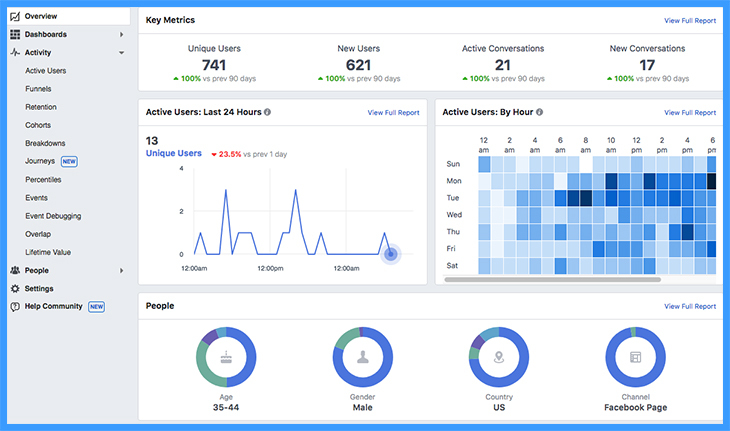 With the targeting performance and analytics tools, you’ll soon realize why advertising on Facebook can be highly profitable. It can be tempting to fire up Ads Manager before implementing the Facebook Pixel and creating custom audiences. While Facebook does give you some tools to target potential customers on the fly with demographic, age, and interest targeting; those audiences will never be as targeted as a custom audience. Don’t be satisfied with just 1 ad. 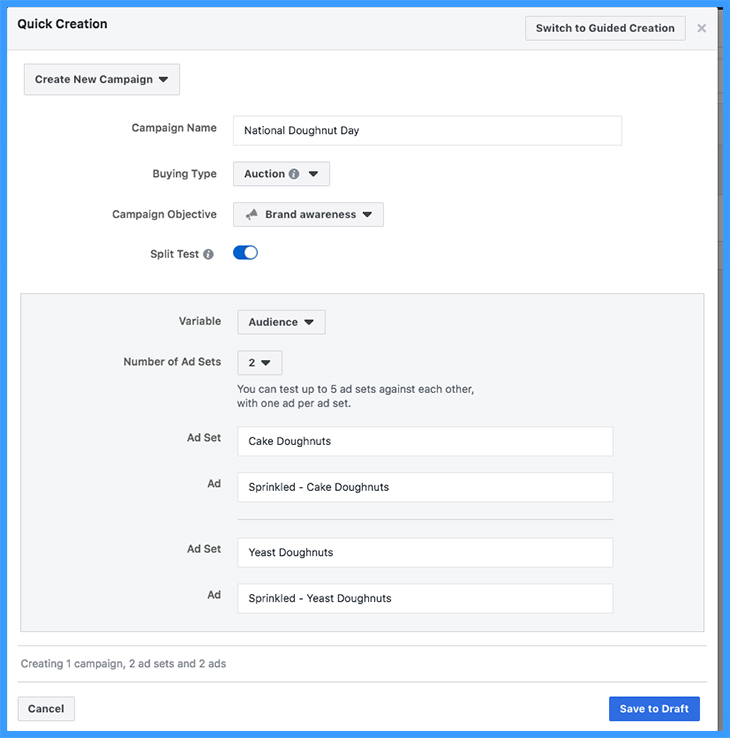 Create 2-3 ads and multiple ad sets to find the winning graphic and targeting that works for your business. Once you have a winning formula, keep running ads until the performance declines and repeat the process. Ad performance will typically decline once you’ve exhausted an audience with the same creative. You don’t need to spend hundreds of dollars per day but do keep in mind that higher overall budgets will lead to better results. If you only have a few dollars per day to spend, you might be missing out on a more exclusive but much more likely to purchase audience. A good budget when getting started is around $20 per day with a minimum test window of 15 days. There is a lot of information about using Facebook Ads and other Facebook publishing tools. Stay up to date by reading blog posts like these, using the Facebook help documentation, and Googling often. You’ll seriously learn something new, every day if you just put in the effort. By now, you should have a basic understanding of the Facebook platform and how it can help grow your business. If you take away one thing from this article, it is that Facebook is here to stay and it will truly help you grow your business as long as you put in an honest effort. We’ll be realeasing several in depth guides to Facebook Ads, Local Business Listings, and Facebook Video soon. Stay tuned for future updates. Questions, Comments, Advice? Head over to one of our social media pages and join the discussion.